Surname Saturday: The Yarrow family. An unusual surname lives on through large families and a drive for business. My maternal great grandmother gives me my connection to this unusual surname of Yarrow. She, Maude Yarrow, was born just over 110 years ago, living to the ripe old age of 104 – an age that is not unlike those reached by her many siblings – some of whom are still alive today. 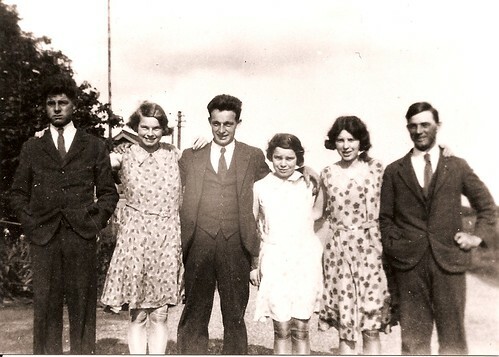 Six of the 15 Yarrow children during the 1930s. During the Victorian era, my Yarrow relations were concentrated in the villages of Little Thetford and Stretham, just a few miles outside of Ely, Cambridgeshire. Here they seemed to have dealings in practically every business going – pubs, shops, farms, church, school, dairy, brewing, charities for the poor, musicians, railways, parish council and even the parish’s census returns. The Yarrow family owned and ran both The Wheat Sheaf and The Three Horseshoes pubs over the years, often alternating ownership between them and the Dewsbury family. Neither pub is operating now. The Yarrow name, despite being unusual, was relatively common in these fenland parts due to large families. Despite riots in Little Thetford during 1833, then inclosures in 1844 benefited the family when they gained large areas of land – with William Yarrow receiving the second largest chunk of land (45 acres) after Mary Hammond (60.5 acres), and another Yarrow member receiving a smaller chunk. This event would inevitably set them up as major land owners and employers, as well as influential people in the parish. William Yarrow (far right) at Liverpool Cathedral. During the late 1800s my Gt Gt Gt Grandfather, James Yarrow, is well recorded as having performed and travelled with his “fine alto voice” accompanied by his equally able brothers, Owen, William and Albert. Newspaper reports praise their regular performances and fine singing voices. I can only assume that they were some kind of early boy-band! 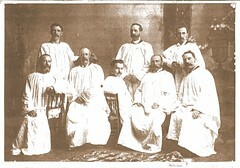 Whilst Albert is noted as being an organist at one point, William eventually moves north, where he is a key member of the choir – performing for Kings at Liverpool Cathedral. Both myself and my mother both have musical skills and it’s a nice thought that perhaps this is where it comes from. In my ancestry, it is the Yarrow family that appear to have had the largest families. My own Gt Grandmother was one of 15 live-born children – none of whom were twins, and most survived into adulthood. She claimed that there were 21 children, but church records don’t support this (although this might not cover still-born or miscarriages). Meanwhile, her aunt and uncle – John ‘Jack’ William Yarrow and his wife Amy Ann (née Howard) had a family of nine children too. Of those that did survive their first years, reaching the ages of 90 and 100 is very common, which suggests that perhaps the Yarrow genes have an air of longevity to them. Looking at the Yarrow families of the late-Victorian era, there is a higher frequency of female births, which may suggest a reason why the surname has become uncommon/unusual, with daughters adopting married names. It is unclear as to what is the true origin of the Yarrow surname. It could be from the Achillea plant, a river in Lancashire, a place in Scotland, or a Viking target in South Tyneside.